The arts scene is a burgeoning one here in Normal Heights. The evidence being the number of horn rimmed glasses, skinny jeans and Apple accessories you see on the streets. OK, it goes without saying, but there are a number of, what the internet and often hateful people have dubbed, “hipsters” in the neighborhood. However, this should not dissuade you from buying a home in Normal Heights. Just the contrary. In fact, myself having lived in many a “hipster community” (Williamsburg in Brooklyn, NY and Silverlake in LA to name two), can tell you this. Where the hipsters go, is where the savings are. Condos available in Normal Heights are not the perfect buy for someone who wants a turn key situation in a new home. Of course, that depends on your definition of “perfect buy”. If you’re like me that could mean “less than $200,000”. Which means, for the average home buyer, that there is plenty of renovation wiggle room in your budget. After all, who wants to just turn a key when you can create your own dream home? The single family homes in Normal Heights are often filled with roommates and not the perfect nuclear family. So needless to say it’s the kind of neighborhood where the word “community” is stretched a little. If, of course, your understanding of that word is a very “Leave it to Beaver” type of 1950’s gee whiz lifestyle, that is. If you already have a broad view of what “community” means than Normal Heights is the perfect place to start looking for your new home. 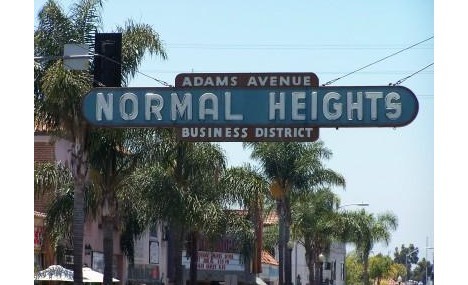 Bottom Line, Normal Heights may not be “normal”, but what is? It’s a safe, progressive neighborhood with a growing identity.